Coronation chicken is a combination of precooked cold chicken meat, herbs and spices, and a creamy mayonnaise-based sauce which can be eaten as a salad or used to fill sandwiches. Normally bright yellow, coronation chicken is usually flavoured with curry powder or paste, although more sophisticated versions of the recipe are made using fresh herbs and spices and additional ingredients such as flaked almonds, raisins, and crème fraîche. The original dish used curry powder, as fresh curry spices were almost unobtainable in post-war Britain. Constance Spry, an English food writer and flower arranger, and Rosemary Hume, a chef, both principals of the Cordon Bleu Cookery School in London, are credited with the invention of coronation chicken. Preparing the food for the banquet of the coronation of Queen Elizabeth II in 1953, Spry proposed the recipe of cold chicken, curry cream sauce and dressing that would later become known as coronation chicken. Coronation chicken may have been inspired by jubilee chicken, a dish prepared for the silver jubilee of George V in 1935, which mixed chicken with mayonnaise and curry. Additionally, for the Queen's Golden Jubilee in 2002, another celebratory dish was devised, also called Jubilee chicken. 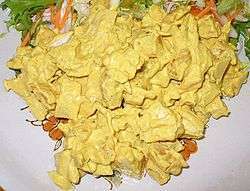 Wikimedia Commons has media related to Coronation Chicken.